2. Why Use a Rice Cooker? Rice cookers take the guess work out of cooking rice in a sauté pan of water on the stove. They have warmers to keep it at the right temperature never having it be gooey or mushy as when cooking on the stove. Brown rice can be cooked as well as white rice. Brown rice is healthier for a great source of macronutrient protein, vitamins, and minerals. Using a rice cooker, you will never have mushy rice or hard centers. When you cook rice on the stove, it can become starchy and that can raise blood sugar for gaining weight. You can also cook pasta to the perfect al dente (firm to the tooth), and vegetables, and sauces. You might have read that specific rice cookers have “fuzzy-logic” and wonder what that is. Fuzzy-logic rice cookers use computer chips for making the proper changes for the cooking temperature and time. Basic rice cookers are mechanical without the need for fuzzy-logic since they do not have any functions except to cook and turn off. Fuzzy-logic technology automatically adjusts cooking parameters for best cooking performance. 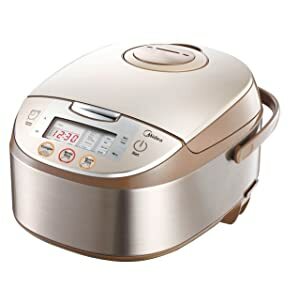 The Zojirushi Neuro Fuzzy® electric rice cooker model NS-ZCC10/18 thinks for itself with its logical technology keeping the temperature and time perfect maintaining its warming cycle, extended warm, and reheat. The color is white and is available in 1.0 and 1.8 liter sizes. This is not a pressure cooker. The aluminum inner non-stick inside cooking pot is spherical to cook and maintain heat evenly and has measurement marks inside. The outside handles are cool to touch. The inner aluminum lid is removable for easy cleaning. The cord is hard-wired and retracts for storage. 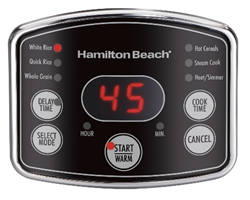 With the 2 delay timer settings, you can set it to cook your rice or foods to be done when you get home from work. The clock and timer uses LCD (liquid crystal display). It will countdown 10 minutes before your rice is finished with a tone. It then goes to the warming cycle and does not automatically turn off. It does not come with a steam basket. 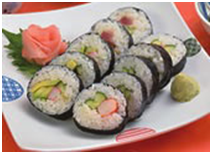 Select from the fuzzy-logic settings for white or brown rice to be either soft to hard and it creates sushi. Quinoa and black rice are cooked on the regular/brown rice mode. You cannot cook beans but you can cook pasta, risotto, steel cut oats, grits, jasmine and basmati rice, and more. Porridge is an old word for cooked breakfast cereals. It will cook all types of rice perfectly. Do not use metal utensils; use wood, rubber, or plastic. Wash the inner lid and inside pot by hand. This 1.0-liter unit holds 5.5-cups of water and it measures 10-1/8-inches wide x 13-inches deep x 8-1/8-inches high. The cooker weighs about 9 pounds. Plug the UL® listed cord into a USA 110/120-Volt, 50/60 Hz outlet at 680-Watts. Countries outside the USA will need to purchase a 220/240-Volt adapter. Or buy from Amazon.com® UK for 240-Volts. It is ETL® listed for the USA and Canada. It also has a CR2450 battery inside the bottom cover. When you keep it plugged it, it will not drain the battery. The battery is used to keep the clock running the same as an electric coffee pot. It is California Proposition 65 compliant and read more here. 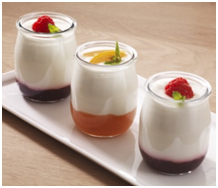 Be sure to use the measuring cups provided that are denoted in the recipe book for calculating. Gift-wrapping is available for a special occasion, family, and friends. You will receive with your rice cooker 2 measuring cups, nonstick rice scooper and holder, recipes and a 1-year Limited Warranty. The instruction manual is available in English, French, Traditional Chinese, Korean, and Japanese. The cooker is made in Japan. Zojirushi America Rice Cooker instructions video here. 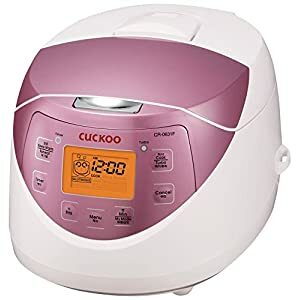 The Cuckoo brand of South Korea has been involved in cooking technology for about 40 years making a trustworthy rice cooker with fuzzy-logic technology. The model CR-0631F pink and white cooker uses 6 cups of dry rice for perfectly cooked rice every time. It will also cook as little as 1 cup of rice. It has slow or turbo (fast) cooking functions. This is not a pressure cooker. The inner pot is aluminum with Teflon® coating so that nothing sticks being easy to clean by hand washing; Teflon® does not do well in dishwashers. The internal pot has a flat bottom with curved sides for even cooking. It will cook GABA (gamma aminobutyric acid) rice a beneficial amino acid found in green beans, peaches, and other foods. Our brain produces GABA that lowers anxiety and permits deeper sleeping, lowering blood pressure improving heart function. The Cuckoo will cook white, brown, and all types of rice. With its 6 cooking functions, you will never go wrong preparing grains, rice, and cooked cereals. The LCD control is large and easy to read. Plug the UL® listed cord into a USA 110/120-Volt, 50/60 Hz outlet at 580-Watts. Countries outside the USA will need to purchase a 220/240-Volt adapter. The cord does not retract into the body. It is California Proposition 65 compliant and read more here. The dimensions are 9.3- x 12.5- x 8.4-inches and weighs about 6.8 pounds. Gift-wrapping is available for a special occasion, family, and friends. You will receive with your rice cooker 1 measuring cup, a nonstick rice scooper, User’s Manual, and a 1-year Limited Warranty. The cooker is made in Korea. 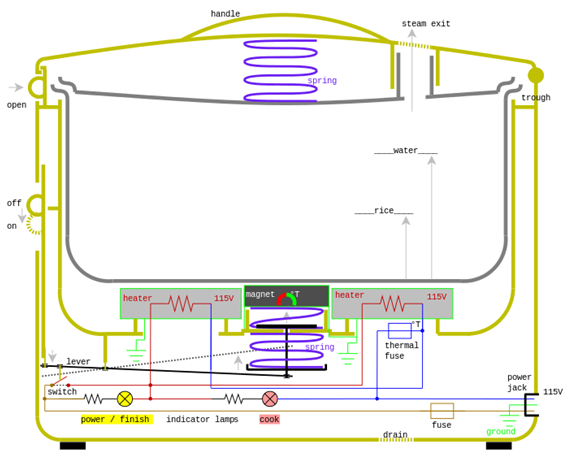 Cuckoo Electric Rice Cooker instructions here. The Tiger rice cooker model JNP-S10U-HU holds 5.5-cups of dry rice in urban satin, white, or lovely flower colors. The rice will double in size when fully cooked. The inner aluminum pot has a nonsticking interior so that your rice never sticks to the bottom or sides. The cooker will keep your rice or other foods warm for up to 12 hours. The outside is made of plastic, and the feet will secure to the cabinet surface. It does not use fuzzy-logic. This is not a pressure cooker. The power cord is retractable and it uses one easy switch to get the job done. It comes with a removable steam vent in the lid that can be hand washed. There are no buttons for specific rice types; it will cook all types of rice, quinoa, and grains by using water and steam in about 30 minutes. Simply follow the instructions in the booklet provided. Plug the UL® listed cord into a USA 110/120-Volt, 50/60 Hz outlet at 505-Watts. Countries outside the USA will need to purchase a 220/240-Volt adapter. Be sure to use the measuring cup provided that is designated in the recipe book for calculating measurements. Gift-wrapping is available for a special occasion, family, and friends. 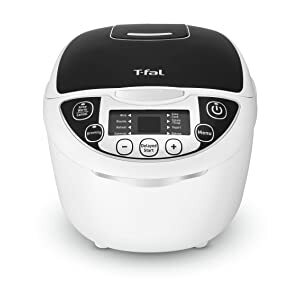 You will receive with your rice cooker a User’s Manual, 1 measuring cup, a nonstick rice scooper with mount for the side of the cooker, and a 1-year Limited Warranty. The cooker is made in Japan. Tiger rice cooker video here. The Midea model MB-FS4017 is energy efficient with multi-functions fuzzy-logic that will keep your food warm and reheat automatically. The 12 programs let you cook minute rice, white, brown, and other types of rice including congee, cereals, oatmeal, baby cereal, soup, and steam vegetables. It holds 8 cups of dry rice to the max line. You will love the LED digital control panel and clock. The unit has an on/off switch to turn off never needing to unplug. This is not a pressure cooker. 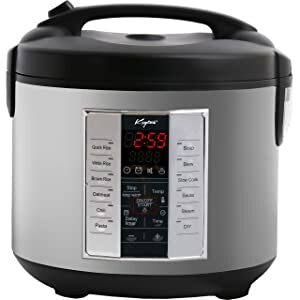 The top selling cooker on Amazon.com® is also a slow cooker with a 24-hour delay timer. 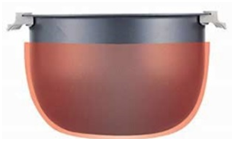 The inner pot is 2.0 mm thick coated with resin (not Teflon®). For healthy living, it is petroleum, PTFE (polytetrafluoroethylene), PFOA (perfluorooctanoic), lead- and cadmium-free. It has a large inner basket for the rice and a smaller top steamer to cook rice and vegetables at the same time. The measurements are engraved on the inside. It is easy to remove and clean by hand washing. Plug the UL® listed cord into a USA 110/120-Volt, 50/60 Hz outlet at 875-Watts. Countries outside the USA will need to purchase a 220/240-Volt adapter. The dimensions are 16.65-inches wide x 12.48-inches deep x 10.16-inches high and weighs about 9 pounds. Gift-wrapping is available for a special occasion, family, and friends. You will receive a User’s Manual and a 1-year Limited Warranty plus 2 measuring cups and a spoon. The cooker is made in China. Midea rice cooker video here. Hamilton Beach® has been making kitchen appliances for decades. 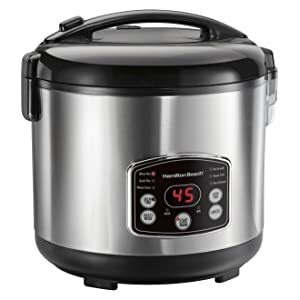 They’ve outdone themselves with this stainless-steel model 37548 multi-purpose cooker. It will hold 2 to 14 cups of cooked rice or any food. Use 1 to 7 cups of dry rice for the perfect amount cooked. It is BPA-free. This is not a pressure cooker. The control panel with LCD light gives you 6 quick programs from which to choose. You will be able to steam, heat, and simmer. You can delay starting your cooking up to 15 hours. After cooking, the cooker changes to warm automatically. It beeps when cooking is done. Steam cook vegetables, fish, and meat. Use the heat and simmer mode for pasta, beans, soups, and one-pot dinners. You cook almost anything: white, brown, and all varieties of rice whether long or short grain, quinoa, farro, and other grains, grits, cream of wheat and more. The 2-in-1 non-stick rice rinser and steam basket is convenient and easy to clean. Put your meat and vegetables in the basket with your rice in the bottom for a one-pot meal. Plug the 26-inch UL® listed cord into a USA 110/120-Volt, 50/60 Hz outlet at 875-Watts. Countries outside the USA will need to purchase a 220/240-Volt adapter. The dimensions are 11.06-inches high x 10.75-inches wide x 10.75-inches deep and weighs about 4.8 pounds. Gift-wrapping is available for a special occasion, family, and friends. 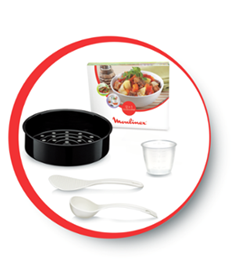 You will receive a User’s Manual with your rice cooker, 1 measuring cup and rice paddle with a 1-year Limited Warranty. The cooker is made in China. The T-fal® model RK705851 multicooker can do just about everything and is affordable! With its 10 cooking programs and 12 different cooking functions, you can create an assortment of meals. The push button digital control panel is easy to use and understand. It has fuzzy-logic technology for perfect cooking every time you use it. It has a 10-cup capacity to cook for 10 or more people. This unit is not a pressure cooker. You will be able to prepare efficiently all types of rice including sushi rice, cereal, porridge, risotto, baby food, stew, steam veggies, make soup, bake desserts, and create crusty frying, with the ability to keep all food warm, reheat, with its adjustable cooking time and delayed start functions. It will not make bread but will make oatmeal, grits, pasta and sauce, grains, quinoa, and more. Use it as a slow cooker for ham hocks, beans, and cornbread. This specialized cooker even makes yogurt! 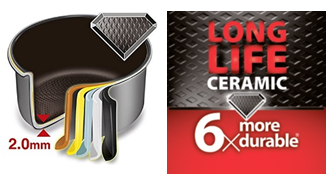 The inner pot is coated with 6 times more durable ceramic for the best health and non-sticking surface and is 2.0 mm thick holding 2.366 liters. The coating is the same as that used in ceramic pots and pans cookware. The diamond-shaped pattern in the bottom provides greater cooking. Delay your cooking time for up to 24 hours. The inner bowl is dishwasher safe. With its micro pressure valve, you will smell the food aroma and the food tastes better. This is not a pressure cooker. Plug the short detachable UL® listed cord into a USA 110/120-Volt, 50/60 Hz outlet. Countries outside the USA will need to purchase a 220/240-Volt adapter. Gift-wrapping is available for a special occasion, family, and friends. 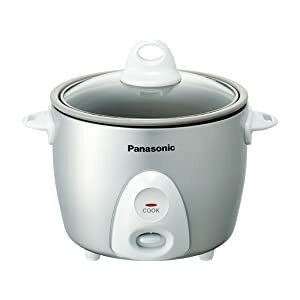 You will receive with your rice cooker, 1 soup and 1 rice spoon, spoon holder, measuring cup, colorful recipe book, User’s Manual in English, Spanish, and France, with a 1-year Limited Warranty. The cooker is made in China. T-fal® 10-in-1 Rice and Multicooker video here. 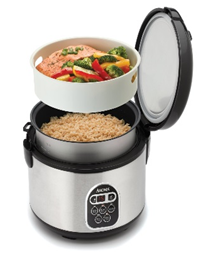 The Aroma® Housewares multi-function cooker prepares 10-cups uncooked to make 20-cups of rice. The model ARC-150SB exterior is a brushed stainless-steel finish. Feel confident using the digital cool-to-the-touch control panel on the side front for the best tasting foods ever. The lid is hinged and not removable and easily cleans made of BPA-free plastic inside. The hinged, locking lid seals in moisture and steam for fluffier rice. 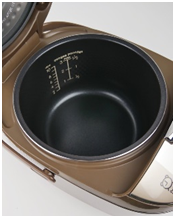 The interior pot is non-stick surgical-grade 304 stainless-steel. This is not a pressure cooker. Cook your rice from 4 to 20 cups to perfection on the bottom using the tray above for vegetables. The time delay can be set for up to 15-hours for adapting to your day’s schedule. The keep food warm function lets it sit staying warm until others get home. It has a beeper to let you know the food is cooked then goes to the keep-warm mode. When you press the power button it turns off and you need to unplug it from the wall. 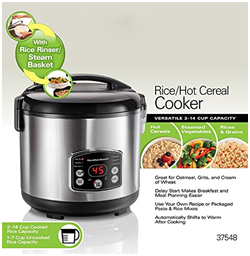 The cooker is superb for all rice types, colors, and lengths, quinoa, stew, soups, roasts, jambalaya, and more. You can cook beans if you soak them overnight first. Plug the UL® listed 2-prong plug into a USA 110/120-Volt, 50/60 Hz outlet at 650-Watts and 5.4-Amps. Countries outside the USA will need to purchase a 220/240-Volt adapter. The dimensions are 10.83-inches long x 11.22-inches wide x 10.83-inches high and weighs 5 pounds. Gift-wrapping is available for a special occasion, family, and friends. You will receive with your rice cooker a measuring cup, serving spatula, and recipe book, a User’s Manual with a 1-year Limited Warranty. The cooker is made in China. 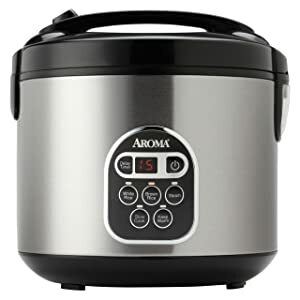 Aroma® Housewares Rice Cooker instructions here. 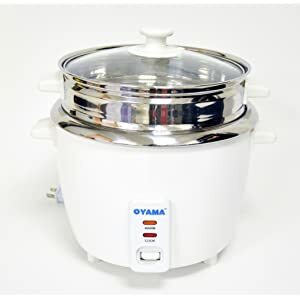 The OYAMA™ rice cooker model CNS-A15U makes 16 cups of rice from 8 cups of dry rice. 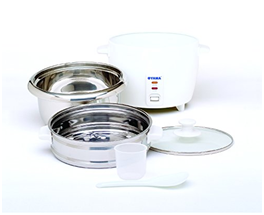 It comes with grade-304 stainless-steel inner pot and tray and a one-touch control. When you have concerns about Teflon® rice cookers, search no farther—this uses no Teflon® for non-sticking. The top lid is tempered glass with a venting hole for steam and you can see what’s cooking. This is not a pressure cooker. It cooks all grains, all types and colors of rice, and vegetables. You can prepare baby food cooking baby’s vegetables to mush, make quinoa, porridge, and steam fish. Stainless-steel is easy to clean and is safe in the dishwasher. The cooking components are all stainless-steel for those who do not want non-stick coatings. It will cook your meat, veggies, and dumplings then switch to the keep-warm mode. The cooker does not turn off automatically; you will need to unplug it from the wall outlet. Plug the UL® listed 2-prong plug into a USA 110/120-Volt, 50/60 Hz outlet at 500-Watts. Countries outside the USA will need to purchase a 220/240-Volt adapter. The dimensions are 11-inches long x 11-inches wide x 11.50-inches high and weighs about 5 pounds. Gift-wrapping is available for a special occasion, family, and friends. You will receive with your rice cooker a measuring cup and serving spatula, a User’s Manual and a 1-year Limited Warranty. The cooker is made in China. Unboxing and evaluating the rice cooker here. The Keyton rice cooker has a large LED digital control screen for many cooking possibilities and cooking functions. Model K2SSRICECOOKER automatically keeps food warm and the 24-hour advance setting is convenient when on-the-go or busy around the house. It holds 10 cups of dry rice making 20 cups of fluffy cooked rice. This is not a pressure cooker. 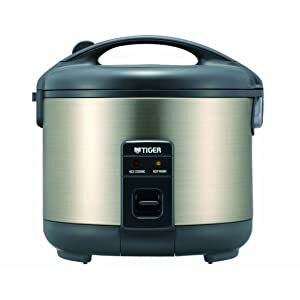 The stainless-steel rice cooker with a non-stick coating, durable lid, and handle to carry, with a steam vent in the lid is convenient. You can make any rice you want in all rice colors, oatmeal, steel-cut oats, porridge, pasta, chili, and vegetables. The inner pot is non-stick and is 1.0 mm thick. Plug the UL® listed cord into a USA 110/120-Volt, 50/60 Hz outlet. Countries outside the USA will need to purchase a 220/240-Volt adapter. The dimensions are 11-inches long x 11-inches wide x 10-inches high and weighs about 8 pounds. Gift-wrapping is available for a special occasion, family, and friends. You will receive with your rice cooker a measuring cup, spoon, and serving scoop, a User’s Manual, and a 1-year Limited Warranty. The cooker is made in China. 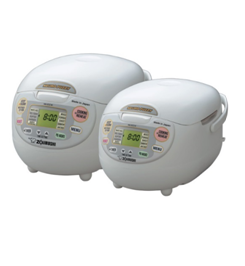 The Panasonic® rice cooker model SR-G06FGL uses 3 cups of dry rice making 6 cups of cooked fluffy rice. The one-step automatic cooker has a tempered glass lid with top knob to lift. The pan is non-stick coated aluminum for your vegetables or other foods. It does not have a separate steam basket. The auto shut-off function turns the machine off when the rice is cooked. It is specific for cooking rice, not vegetables or other food items. It does not use fuzzy-logic. 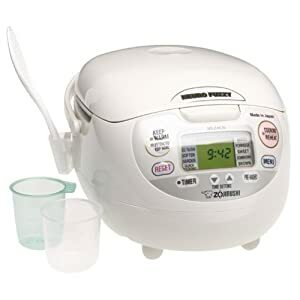 This is a great Japanese rice cooker. This is not a pressure cooker. Create light, fluffy, restaurant-quality rice perfect for side dishes or stir-fry. Make sticky rice for rolling sushi, make Spanish rice for burrito and enchilada dinners, or hearty wild rice to add to a tossed green salad, or even creamy rice pudding with raisins and cinnamon sprinkled on top for dessert. Plug the 35-inch UL® listed 2-prong cord into a USA 110/120-Volt, 50/60 Hz outlet at 310-Watts. Countries outside the USA will need to purchase a 220/240-Volt adapter. It is ETL® and UL® listed for the USA and Canada. The dimensions are 8.1-inches long x 10.2-inches wide x 8.5-inches high and weighs about 8 pounds. Gift-wrapping is available for a special occasion, family, and friends. You will receive with your rice cooker a measuring cup and rice scoop, a User’s Manual, and a 1-year Limited Warranty. The cooker is made in India. America stopped importing toys made in China due to toxicity in them. Therefore, I ask you do you know any brown rice cooker that is not made in China, and is California proposition 65 compliant? If so, what is the model and dealer that sells these? Thank you. This should have been the main factor in your reviews. First off, I’m aware of the USA not importing toys from China due to toxicity, yet they do. You are offensive telling me what should have been the main factor in my reviews. Most everything is made off-shore, including China, Taiwan, Korea, Mexico, and more. Rice cookers were developed in Japan, not the USA. If you can find cookware made in the USA, let me know. Of course, I check for that first when reviewing these rice cookers. They are actually quite good and I own the #5 Hamilton Beach that has never given me one problem ever. You will find with the NAFTA Agreement the USA has, that very few products are made here anymore.